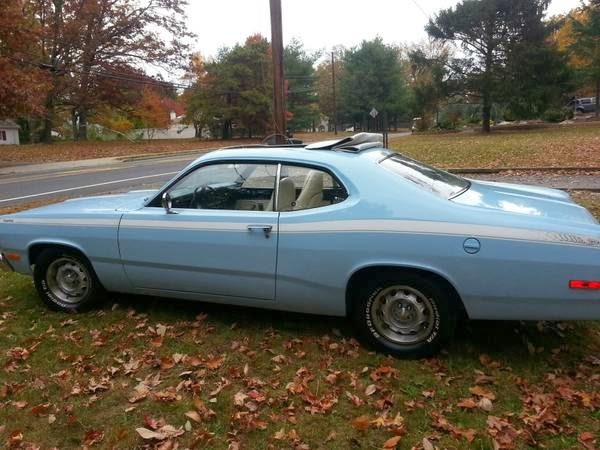 1972 Plymouth Duster - Did you ever think you'd see someone asking $18,000.00 for a Plymouth Duster? If you're my age, probably not. Dusters were a dime a dozen back when I was in high school. But, I did a little research before posting this car. If you scour Hemmings, you'll find Dusters selling for more than this one. Much more. This car, in the condition it's in and the options it has, is probably priced correctly. Yikes. This Duster looks to be in immaculate shape. It has a 318 V8 and a fairly rare factory cloth sunroof. An old Duster is not on my wish list, but if one is on yours - and I have respect for anyone who buys and preserves any old car - this car might be worth checking out. Located in Marlboro, NJ, click here to see the Craigslist ad. 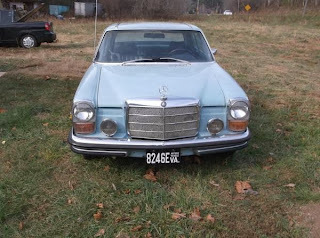 1971 Mercedes-Benz 250C - So, if 40 years ago, someone came to me and said that in 2013 a 1972 Plymouth Duster would be selling for 6 times the amount a clean 1971 Mercedes Benz 250C was selling for, I would have thought they had taken one too many hits of acid. But, for 1/6th the price of the Duster, you can own this MB 250C. Goes to show just how weird the old car market is. Some old coupes look sporty and some look classy. The 250C is definitely in the latter category. In their day, they were the type of car a valet parked in front of the restaurant. Classy cars out front meant classy food inside. The seller didn't post many pictures, but, other than a broken A/C, it sounds like this car is in good condition. Located in Stuart, VA, click here to see the Craigslist ad. 1978 (1965) Midas - I wrote about this car back in April of 2011. (You can find the post here.) It's back on the market. From everything I have read, it is a well made, well thought out kit car. (Although quite a few were sold fully built.) Its biggest drawback is its styling, which is unique, to say the least. I ended my 2011 post by writing, "A bright orange, RHD, Midas is not a car you'd want to drive if you're in the Witness Protection Program. But, if you can get used to its looks and don't mind answering questions every time you drive it, this would be a fun car to own." There's nothing more I can add to that. Located in Clinton, WA, click here to see the eBay listing. A big thanks to JaCG reader, Gene, for sending me this car via the Just a Car Geek Facebook page. I scoffed at the price at the Duster, until I looked at the ad and the car. Tons of options and eye appeal. It looks great. 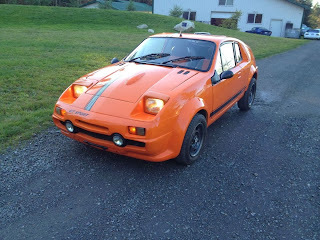 I’ve only seen one other “suncasher” type sunroof Duster before. The color combo gives this car an almost European look. With the bucket seats and a 318, it is almost a muscle car. All of those combined with the condition makes it look like a good value.